Each year South Africans are told of ‘surges’ in attacks or a ‘war’ on police. These claims are often misleading and excite politicians unfamiliar with the data. They also make police officers feel unsafe, potentially priming some for premature use of force. Such statements direct attention away from where improvements in officer safety can still be made. Last year, fewer police were murdered on duty than has ever been recorded. The most common cause of death for South African Police Service (SAPS) officers is off-duty car accidents – so the easiest way to save police lives is to improve driving habits and abilities on the road. Cele was no doubt expressing his understandable outrage at the murder of police at an event where emotions would have been high. However, this could come at the risk of encouraging police abuse of force while masking the significant progress the SAPS has made in improving officer safety. 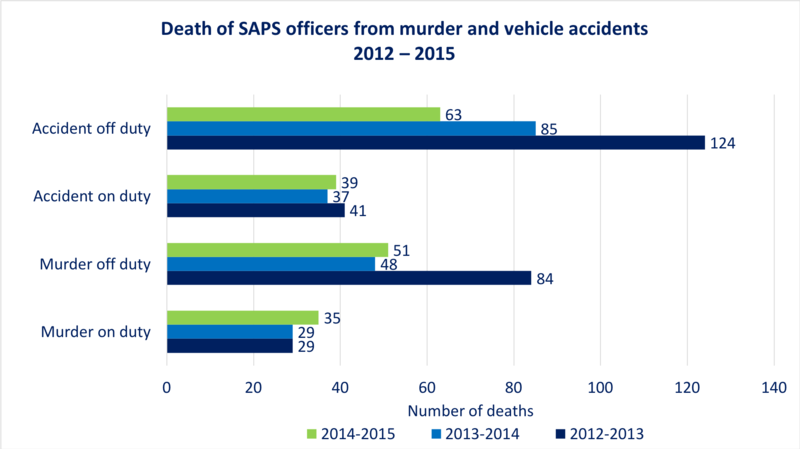 South African police are considerably less likely to be murdered today than they were three decades ago. 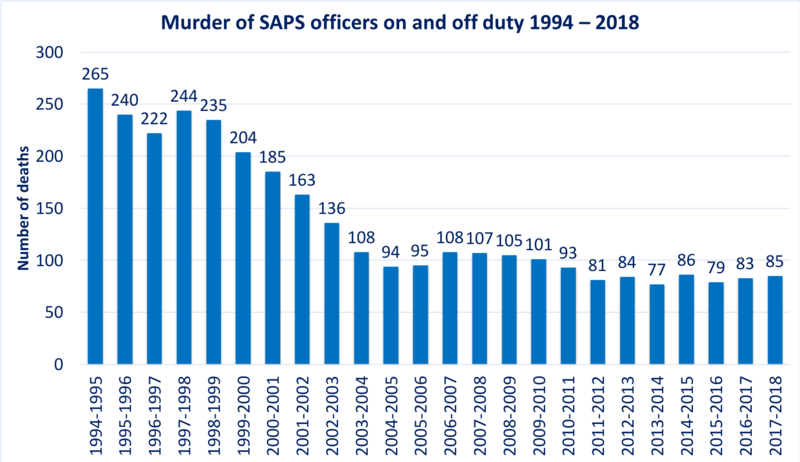 Police murders have declined fairly consistently for nearly 30 years, despite SAPS personnel increasing by 35% in the same period (Figure 1). A comparison of police killings when officers were both on and off duty shows a significant decline. In 1993, the overall rate of police murders was 326 per 100 000. This dropped to 56 per 100 000 in 2017/18. The trend for on-duty murders shows a similar drop. In 1993 on-duty police were killed at a rate of 120 per 100 000. By 2017/18 the ratio was 19 per 100 000. The risk of being murdered is also lower for police (while on duty) than it is for the average South African. The country’s national murder rate in 2017/18 was 35 per 100 000, compared to 19 per 100 000 for on-duty police. We should celebrate this progress in officer safety, while continuing to improve it until no officer is murdered in the line of duty. But with more police dying in vehicle accidents each year than are murdered (Figure 2), preventive measures should also be focused here. South Africa has among the highest road death rates in the world, so all its road users are at risk. But SAPS officers who spend a significant amount of their days and nights on the road face a greater danger. Police are at times required to speed and drive recklessly and almost never wear seatbelts – indeed they are exempt from doing so. Organisational and popular cultures promote the idea that police must be able to leap from vehicles to apprehend suspects or seek out safety. But between 2012 and 2015, 117 officers died in on-duty car accidents while 93 were murdered on duty. During the same period, 313 officers died in off-duty crashes while 183 were murdered off duty. Many of these road deaths could probably have been avoided had officers worn seatbelts. And those who don’t wear seatbelts at work are unlikely to do so off duty. Police also need to respond quickly to calls for service. They are allowed to break some laws in order to enforce others, for instance speeding and running red lights when pursuing fleeing suspects. But it’s a slippery slope between necessary and lawful rule breaking, and unnecessary, everyday rule breaking. It is possible that some police regularly speed and break other road rules, whether in pursuit or not, on duty or off. The combination of routinely reckless driving and not wearing seatbelts helps explain why more police die on the road than are murdered. After car accidents, the most common cause of death among officers is off-duty murder. According to the SAPS, most such murders occur when off-duty police become victims of robbery. One explanation may be that police are targeted for the firearms they are thought to be carrying. If this is the case – though SAPS refutes it – consideration should be given to whether having officers take firearms home does them more harm than good. It is also possible that some officers killed off duty simply live in violent neighbourhoods, or fall victim to the same risk taking and violence that pervade South African life. According to the SAPS, most murder countrywide is the result of arguments. Raised with violence at home and school, many South Africans use violence to resolve conflict, or defend honour or manhood in daily interactions. Police may well be victims of the same patterns of everyday violence. If an officer’s firearm is stolen in the process, the incident may still be classified as a robbery. Violent, unlawful attacks on police officers who are on duty cannot be tolerated. The same goes for an off-duty officer attacked because she or he is a SAPS member. But the murder of police cannot be used to promote or excuse the unlawful use of force by anyone, police officer or not. Such attitudes simply reinforce the notion that violence is the solution for violence, while hiding the significant progress made by the SAPS in keeping its officers safe.